Nice resource: BRIK – Building Research Information Knowledgebase – microBEnet: the microbiology of the Built Environment network. Recently I participated in the Society for Building Science Educators (SBSE) annual retreat (more about this soon). 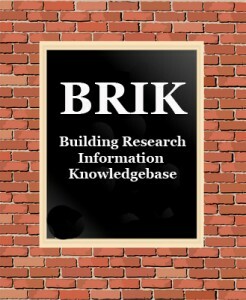 And at the retreat I saw a fascinating presentation rom Richard L. Hayes who runs helps facilitate something called the Building Research Information Knowledgebase (aka BRIK).